Beatrix Potter, or Helen Beatrix Potter (July 28, 1866 - December 22, 1943) was an English author and illustrator of children's books. Her books, now classics, were unique in that she did all of her own illustrations. She took the genre of children's literature to a new level through her highly accurate and detailed drawings of woodland animals. She insisted that her books be miniatures to fit children's smaller hand size, while at the same time employing a more sophisticated vocabulary and realistic situations in order to challenge children's reading abilities. Beatrix Potter's first passion in life was science. She only pursued the career of children's author after her scientific ambitions were thwarted by the lack of opportunity for women in her time. Twice Potter was rejected by the scientific community: First, by the Royal Botanical Gardens and secondly, by the Linnaean Society of London. Later she would be honored by the latter institution for her highly detailed and accurate drawings of fungi. The more easily accessible opportunity that availed itself to Potter's talent was the career of children's author and illustrator, a career in which she excelled. Yet at heart, Beatrix Potter was a naturalist and environmentalist whose work reflects her love of animals and the English countryside. Beatrix Potter was born in Kensington, London in 1866. Her parents, Rupert Potter, a nonpracticing lawyer, and Helen (Leech) Potter lived on their inheritance from the Lancashire cotton industry. She was educated at home by a succession of governesses and had little contact with other children. In later years she would prove to be reticent around adults, while displaying a natural affinity for children. Her joy in the birth of a younger brother, Bertram, was expounded by happy times together searching for fossils and keeping pets. They spent hours exploring the woods, even collecting and dissecting animal skeletons. The siblings kept various pet animals: Frogs, newts, and even a bat. It was her keen scientific observations that first drew Beatrix towards drawing. After being tutored privately, Potter went on to earn an Art Certificate. Potter's natural artistic talent was encouraged by her father, who also shared his love of photography with his daughter. Photography supported her ability to draw highly detailed pictures of animals, and of fungi, (see study of mycology). Potter spent many hours at the British Museum of Natural History where she drew highly detailed pictures of various fungi. Her efforts were encouraged by her uncle, Sir Henry Roscoe, but her attempts to befriend the scientific staff at the museum were rebuffed. During summers, the family would rent a country house, in the early years in Scotland, and then later in the English Lake District. In 1882, the family met the local vicar, Canon Rawnsley, who was deeply worried about the effects of industry and tourism on the Lake District. He would later found the National Trust in 1895, to help protect the countryside. Potter had immediately fallen in love with the rugged mountains and dark lakes, and through Rawnsley, learned of the importance of trying to conserve the region. Later in life, land conservation and farming were to become her primary pursuits, after her career as a children's author waned. When Potter reached the age of young adulthood, her parents appointed her legal caretaker of affairs of the estate, and discouraged her in the pursuit of higher learning. During the teenage years, when most children were able to experiment and branch out with their pursuits, Potter coped with her restrained lifestyle by keeping a journal written in secret code, which she wrote in from the ages of 13 until 31. The code was not deciphered until after her death by Leslie Linder and published for the first time in 1966, and again in 1989. In her journal Potter expresses her difficulty in dealing with domineering parents, and with her attempts to express herself through her work. In one entry she remarks, "I must draw, however poor the result… I will do something sooner or later." Potter experienced bouts of depression and poor health, most likely due to her repressed lifestyle, and rose above these continued obstacles to pursue her talents. In terms of her scientific ability, her uncle, Sir Henry Roscoe, encouraged her interest in fungi and presented a paper she wrote to the Linnaean Society of London. Potter was not able to present the paper herself, because women were not allowed to attend the group's meetings. He also tried to help her gain admission as a student to the Royal Botanical Gardens at Kew, but she was rejected because she was female. Potter was later one of the first to suggest that lichens were a product of the symbiotic relationship between fungi and algae. At the time the only way to record microscopic images was by painting them; her pictures of fungi were, much later, to become widely regarded. Although she made hundreds of scientific drawings on the complex subject of fungi classification Potter, rejected and discouraged, abandoned her scientific pursuits and took her talent in a different direction. Potter's first attempt at writing a children's book was initially written in the form of a letter to a sick child, the son of her former governess. The Tale of Peter Rabbit, about the mischievous bunny who gets lost in Farmer MacGregor's garden, is still one of her most enduring tales. 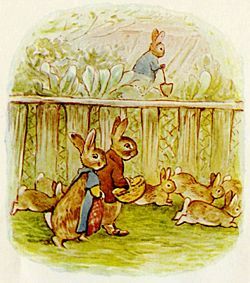 She was encouraged to publish the story as a book but was initially rejected by publishers, until Peter Rabbit was finally accepted by Frederick Warne & Company in 1902. The book was extremely well received and she went on to publish more than twenty others, filled with charming characters like Ginger and Pickles, Jemima Puddleduck, and Mrs. Tiggy Winkle. Potter, a perfectionist with the appearance of her books, insisted on the smaller format that would be easier for a child to hold and read. Her books, distinctive in their looks, were also unique in that they featured all animals, and no humans whatsoever. Although this genre goes back to the time of Aesop's Fables, Potter brought this aphoristic writing to a new level. Her highly detailed and accurate drawings were, perhaps, more expressive of her talent than her writing was to be, although she did employ adult vocabulary and situations in order keep the stories both interesting and challenging. Her books have great appeal to readers of all ages. Establishing an independent means of income as an authoress allowed Potter to grow and develop in other ways as well. She secretly became engaged to the son of her publisher Norman Warne. Due to class distinctions, (Potter's husband worked for a living as opposed to being of a more gentrified class) her parents opposed the marriage, which was tragically thwarted when Warne died of Leukemia one month before the wedding. After the death of Warne, Potter purchased Hill Top Farm in the village of Sawrey, Lancashire, in the Lake District, the location of her happy childhood memories. She loved the landscape and would visit the farm as often as she could, given the fact that she still resided with her parents. Gradually she spent more time there, and as a result, the years from 1906 to 1913 proved to be especially productive for her. During this time she wrote such classics as: The Tale of Jemima Puddle-Duck, The Story of Miss Moppet, The Tale of Mr. Jeremy Fisher, and the The Tale of the Flopsy Bunnies. With the steady stream of royalties from her books she began to buy pieces of land under the guidance of local attorney, William Heelis. In 1913 at age 47, Potter married Heelis and moved to Hill Top farm permanently from London. The couple had no children, although they had a succession of pets including a hedgehog named Mrs. Tiggy Winkle, after a character from one of her books. After moving to the Lake District, Potter became involved in breeding and showing Herdwick sheep. She became a respected farmer, a judge at local agricultural shows, and became president of the Herdwick Sheep Breeders’ Association. She eschewed the fame that came from her books and retired completely from writing in 1930, due in part to her diminishing eyesight. Her last book, written the same year was The Tale of Little Pig Robinson. She was skeptical of recognition and said, "I hate publicity, and I have contrived to survive to be an old woman without it, except in the homey atmosphere of agricultural shows." Beatrix Potter died of uterine cancer at Castle Cottage in Sawrey, on December 22, 1943. She was cremated, and her ashes were scattered in the countryside near Sawrey. Beatrix Potter's books, called the best selling children's book of all time, have never been out of print. Additionally, they have spawned a vast marketing empire which includes the sales of items from figurines to tea towels, all depicting the beloved characters of her tales. In her will, Potter left almost all of her property to Great Britain's National Trust, including cottages, farms, and 4000 acres (16 km²) of land. This legacy ensures that the beauty of the Lake District and the practice of fell farming will remain unspoiled. Her former properties are now part of the Lake District National Park. In 1971, The Tales of Beatrix Potter was released on film. Directed by Reginald Mills, it features several of Potter's Tales choreographed by Sir Frederick Ashton, and danced by members of the The Royal Ballet. The production, nominated for two British Academy Awards, appeals to all ages, and has been acclaimed as one of the few true classics of ballet ever captured on film. The Tale of Pigling Bland was turned into a musical theatrical production by Suzy Conn and was first performed July 6, 2006, at the Toronto Fringe Festival in Toronto, Canada. In 1982, the BBC produced The Tale of Beatrix Potter. This made for TV docu-drama was written by John Hawkesworth and directed by Bill Hayes. It starred Holly Aird and Penelope Wilton as the child and adult Beatrix, respectively. In 2006, author Susan Wittig Albert published The Tale of Cuckoo Brow Wood (Cottage Tales of Beatrix Potter Mysteries), a series of mysteries featuring a fictionalized Beatrix Potter and her farm in the Lake District. Also in 2006, Penguin Books published Beatrix Potter: A Life in Nature, a new biography by Linda Lear which emphasizes Potter's scientific accomplishments both as a botanical artist and as an amateur mycologist. In January 2007, the critically acclaimed Miss Potter, a biopic movie starring Renee Zellwegger and Ewan McGregor, was released. Ms. Zellwegger was described as the "ideal Ms. Potter" for her portrayal of the eccentric author. "I remember I used to half believe and wholly play with fairies when I was a child. What heaven can be more real than to retain the spirit-world of childhood, tempered and balanced by knowledge and common-sense?" - Beatrix Potter’s Journal, November 17, 1896 from the National Trust collection. ↑ Chet Raymo, " The sharp and the half-sharp", Science Musings. Retrieved February 24, 2014. ↑ The National Trust, "The story of Beatrix Potter." Retrieved July 30, 2007. ↑ Britain Unlimited, "Beatriz Potter." Retrieved July 30, 2007. About Beatrix Potter, World of Peter Rabbit. "Potter, Beatrix, 1866-1943", Project Gutenberg. Ockerbloom, John Mark; "Potter, Beatrix, 1866-1943", The Online Books Page. "July 28th On this day in history in 1866, was born Beatrix Potter", Ward's Book of Days. Lear, Linda. 2007; "The Life and Legacy of Beatrix Potter", A Life In Nature.